If you’re the adventurous type, then you know the wonderful feeling that comes with cycling in exotic locations. The little challenge of conquering some distant terrain is enough to get you to pick your bike and go traveling. And yet, despite the allure, a bike is quite a bulky adventure tool to carry along. Hence the need for bike racks. 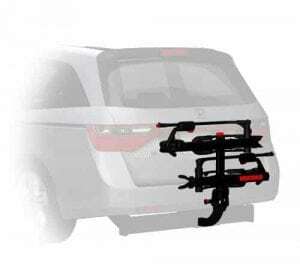 Bike racks for cars offer a safer, more convenient way to take your bike with you, whether you’re going on an outing with the family or just for a solo adventure. Most of them attach quickly to different parts of your car, such as the trunk or the roof. Bike racks come with countless models and brands. All of them have a lot going on for them, and they all have their setbacks too. That’s the big problem. With so much to choose from, how do you pick what works best for you? It would help if you could find some well-curated list of the best bike racks so you can choose from a smaller list, wouldn’t it? We went and did all of the grunt-work, reviewing hundreds of designs literally and even trying some of them out practically. What we present to you is a list of the 10 best bike racks for cars in 2019. Sit back and relax, it’ll be a long ride. The Pro-Series can carry virtually any type of bike. Not only that, but it can also carry up to 4 at a time, making it a convenient bike rack to have. 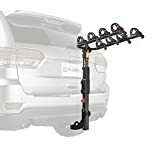 It has a comfortable swing-arm that makes it easy for you to access the lift gate on your car without too much of a hassle and also firmly holds the bikes in place. The bikes themselves are held by cradles that are well padded to provide ample protection to their finish. The bikes are also insanely easy to load and offload with the help of loop straps. To top it all off, the rack has a neat little reflector for night time driving. 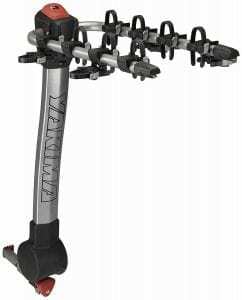 Yakima is very innovative in the bike rack space, and the tray style bike rack does not disappoint. This bike rack was designed to make everything as simple as possible. 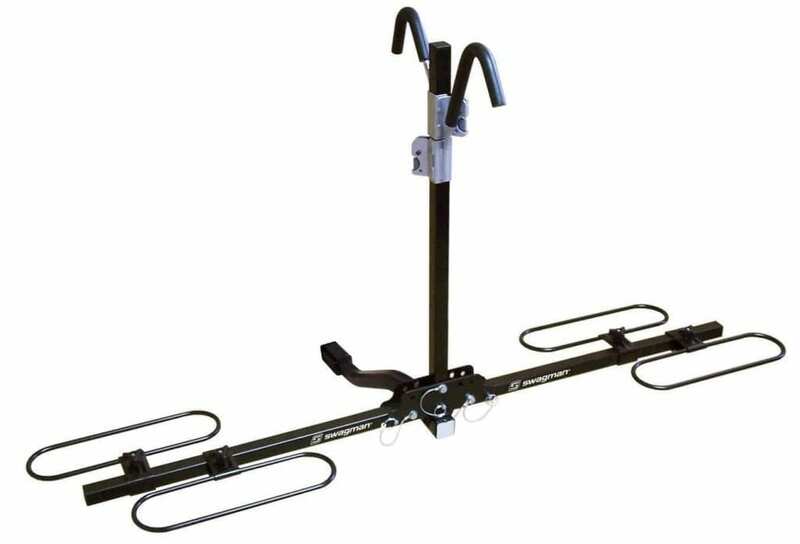 With the tray style bike rack, you can load bikes of any shape and size onto your vehicle. You no longer have to worry about tire diameter and receivers. No matter what your bike looks like, it will fit. The bike rack initially carries two bikes, which is good enough as it is. However, if you want to carry up to 4 bikes, you can easily purchase an add-on. Another thing that the tray style takes into consideration is the need to keep the finish on your bikes intact. Their solution is a no-contact design in the rack, leaving the finish on your bike untouched for the entire trip. When it comes to price, few others can beat the Allen Sports Deluxe. This is another bike rack that effortlessly combines functionality with affordability. It also has excellent capacity and can carry up to 4 bikes. One thing that stands out for the Allen Sports Deluxe is the long carry arms, which make it very easy to fold. However, their most significant advantage is the way they make it possible to secure each bike in place. Additional tie-down systems make it even more stable and secure. The rack itself is designed to be strong, with steel for the frame and a clean black powder finish. To access your liftgate, you can tilt the mast back in one easy motion. This Thule 2-bike platform was made with a particular kind of bike in mind. It accepts bikes with a diameter of between 20 and 29 inches and has 3” receivers. That limits its uses somewhat. However, it has some pretty great features. Also, if you want to adapt it to carry other types of bikes, you can easily buy add-ons for it. For starters, it’s built for 2 bikes at a time. Don’t let that stop you if you have a big family, however. The Thule can easily be upgraded to accommodate 4 bikes at a time. It also has a great hitch switch lever that allows you to tilt it away from your car. If you have bikes with narrower tires, a 2” version is available as well. The rack also with great stability and rust-free protection. 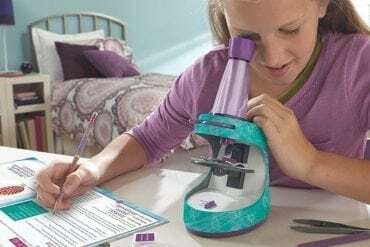 The Saris Super Bones is an example of excellent engineering. The rack itself is part of the Saris Bones Bike Rack Series. The series of bike racks is a meeting point for great engineering and user-friendly design. To be sure, the Saris Super Bones frame looks a lot like the bones its name suggests, with an absolute minimalism about it that might lead you to dismiss it at first glance. However, this bike rack can handle as much as any other, and more in most cases. The arms are injection-molded, and the feet are covered in rubber to increase the stability of the frame as it remains attached to the vehicle. The frame can also be adjusted to suit the shape of any bike by pivoting it at the feet. You also don’t have to worry about the finish on your bike as the straps are coated to protect your bike and allow it to maintain its sheen. The straps themselves are adjustable, enabling them to fit on just about any bike frame. 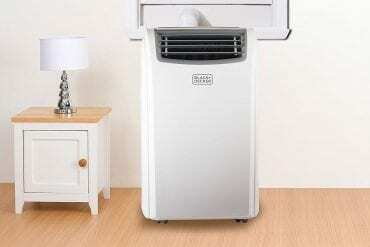 The Allen Sports Premier is an excellent example of value delivered at a pocket-friendly price. 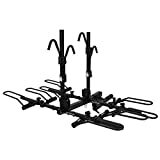 This impressive bike rack is budget friendly and has most of the features you would find on higher priced bike racks. Let’s start with the fact that the Allen Sports Premier can fit up to 4 bikes with 2” receivers. This makes it great for family outings. 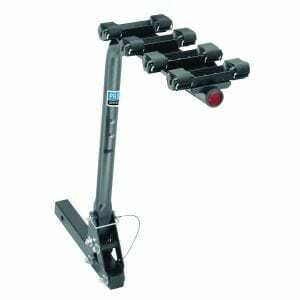 It also minimizes the side to side sway of the bikes through the deft placement of little bolts on the inner parts of the hitch. The Allen Sports Premier doesn’t skimp on security either. Quick set straps and tie down cradles ensure that your bike is well secured for the trip. The set-up is pretty simple as well since the carry arms will quickly snap into place. All in one, this bike rack comes with pretty much the whole package for a bargain. If you want a bike rack with the bells and whistles but don’t want a large expense to go with it, this is by far your best choice. The Yakima RidgeBack is an excellent example of simplicity combines with functionality. 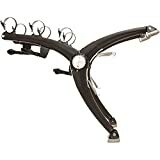 It has unique security features that ensure your bikes are safely attached to the vehicle while keeping them stable throughout the trip. 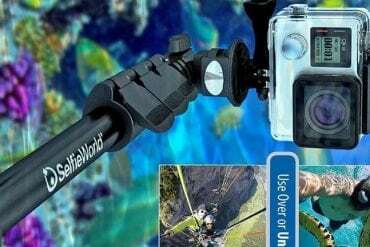 It also happens to be extremely lightweight and easy to carry around. And all that while being able to handle up to 4 bikes! 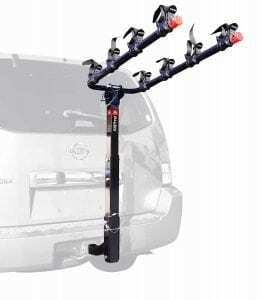 The tool-free locking mechanism makes it super easy to set up the rack and install it in the back of your car. 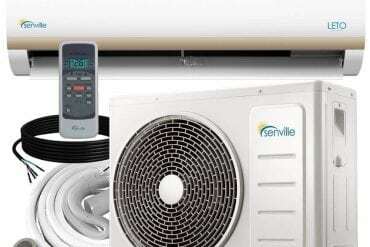 With an adjustable knob, getting everything in working order doesn’t have to make you scratch your head. 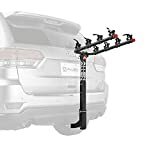 The rack can easily be folded for storage using a control lever that also serves the purpose of bringing it down, giving you access to your car. Anti-sway cradles make sure your backs remain steady throughout the trip. As for the bikes themselves, the Yakima RisgeBack can easily accept both 1 ½” and 2” receivers. The Hollywood Racks was built with capacity in mind. 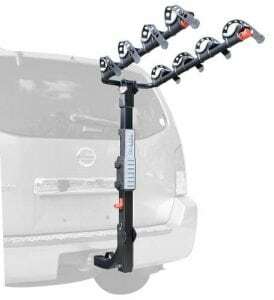 This excellent bike rack carries up to 4 bikes at once with a 2” hitch to secure them. A nifty little locking pin holds the bike in place and prevents it from wobbling during the journey. Additionally, there are Velco wheel straps to make everything extra stable and secure. The rack itself is secured to the vehicle with by a security cable. 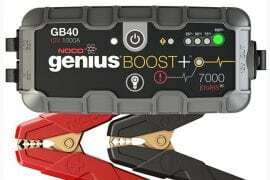 This cable is pretty much ample, so you don’t need any extra tools to do the job. The bikes themselves rest on the rack using wheel holders while the frames are held in place by padded clamps. Perhaps the greatest victory for the Hollywood Racks is the way the rack can be easily folded up against the vehicle whenever you aren’t using it. This gives everything a neat appearance. 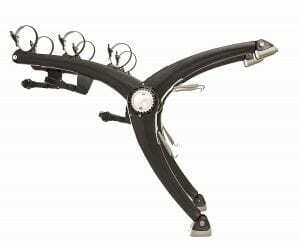 The Thule Helium was explicitly built to solve the problem of heavy bikes. Everyone knows what a hassle it can be to load a heavy bike on to a bike rack for the long journey ahead. It doesn’t help at all if the bike rack itself is heavy and quite the hassle to attach and detach from the car. The Thule Helium solves this problem with a lightweight design. By combining a light aluminum frame with clever engineering that makes it easy to attach, handle and detach the rack, the Thule Helium makes transporting a bike a breeze. Another critical consideration that went into the design of the Thule Helium is security and stability. The cradle for each bike is built with technology that dampens shocks from rough terrain. Couple that with anti-sway cages and your bike is guaranteed not to move much no matter where you’re riding. 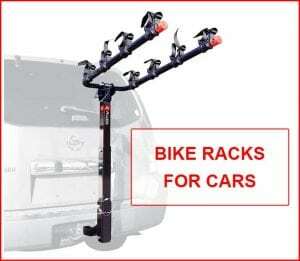 As far as safety is concerned, a locking cable easily secures the rack to the car and the bike to the rack. One of the most significant qualities of this bike is its ability to carry bikes with different tire diameters. 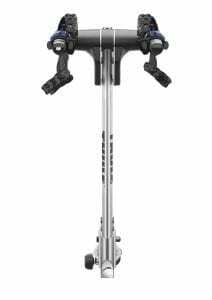 The Swagman can easily accommodate diameters up to 59 cm, which is pretty much most bikes. The Swagman can also carry up to 2 bikes at once. It accepts the 1 ¼” and 2” hitch receivers. That means you are going riding with a partner won’t be a headache anymore if all the two of you have between you is one car. No matter what type of bike you plan on riding, the tire hoops on the Swagman ensure your rack can carry many different types of bikes. Worried about getting blemishes on your bike’s smooth finish? Worry no more; the Swagman’s frame grips have a soft coating to protect the surface of your bikes. Add to that the ease with which this bike rack can be set up, and you’re on to a winner! No matter how secure your bike rack, you can never err by taking extra precautionary measure. Bikes are some of the most commonly stolen items, and the ease with which they can be stolen or simply ride away does nothing to help the matter. For starters, make sure you secure your bike rack and its payload of bikes to the car using a bungee cord or strap. It definitely won’t hurt. Also, when you arrive at your destination, do not leave your bike unwatched. If you absolutely have to leave it unwatched, then invest in a high-quality lock to deter bike thieves. 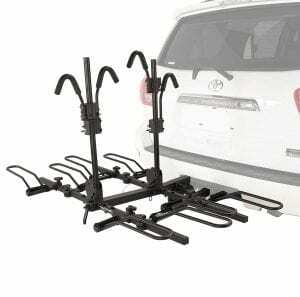 No matter how well designed and sturdy your bike rack is, there are certain limitations imposed on the number of bikes you can carry on your car. Depending on the make and design of your vehicle, and the number of passengers it will have for the trip, there is an optimal weight for the bikes it can carry. Go beyond that weight, and you will start to exert undue stress on your tires and transmission. Make sure you know how much your car can carry beforehand and try not to overload it. As you might have noticed with some racks in the reviews above, they were built to accommodate specific types of bikes. Bikes come in a variety of shapes, sizes, and designs, and it is essential that you know the rack you’re buying can accommodate your bike before purchasing it. Ensure you check things like receiver sizes and the types of bikes a rack takes before you buy it. Additionally, always test your racks before using them on a trip to prevent mishaps down the road. Getting a good bike rack ensures you get to travel around on your bike and take your spirit of adventure with you wherever you go. The racks in this list are more than good; they are the best. You’ll easily find one that matches your needs perfectly. Meanwhile, keep the biking spirit alive.